Oxygen therapy is a medical treatment for those with COPD and other pulmonary complications that prevent them from being able to breathe in enough Oxygen (O2) on their own. Oxygen therapy includes the use of an oxygen tank or concentrator that provides oxygen to the user through a tube and nasal cannula. Instead of having a refillable tank of O2 that the user uses and refills once empty, a concentrator takes in ambient air and concentrates it into pure O2. As the concentrator takes in ambient air, it uses internal components to filter out nitrogen, which makes up the majority of ambient air. Once the nitrogen is filtered out, 90% oxygen is left, along with a few other ambient gases. Once the concentrator has built up enough O2, it will begin providing it through the therapy tube to the user. The nitrogen that is filtered out is released back into the air, and this cycle continues. A concentrator has internal reservoirs that continue to store and provide O2 at at least 90% concentration. Concentrators can provide continuous flow or pulse dose flow. What's the Difference Between Continuous Flow and Pulse Dose Flow? Continuous therapy will provide a steady stream of oxygen at the flow level the concentrator is set to. Continuous flow will ensure that there is always oxygen flowing to the user, even during exhalation. Pulse Dose therapy provides the stream of oxygen during inhalation only. This flow setting allows concentrators that are powered from a battery to have longer run times than if set in a continuous mode. What Types of Concentrators Are Available? There are two main types of oxygen concentrators: stationary and portable. Stationary concentrators are larger units meant to be used exclusively at home. Due to their larger size, they are capable of providing continuous oxygen flow, some even as high as 10 LPM (Liters per Minute). When paired with long oxygen tubing, the stationary concentrator can allow the user to move around the home while receiving oxygen, without carrying anything other than the tubing. 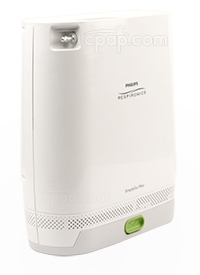 Portable concentrators are smaller units meant to be used both at home and taken along with the user outside of the home. Portable units vary in size, with some being transported on a cart with the user, and others small enough to be carried with a shoulder strap or in a backpack style bag. In order to be smaller in size, portable concentrators have smaller reservoirs, and as a result mainly provide pulse dose therapy. Some portable concentrators do offer continuous flow, but only up to 1-2 LPM. Are Prescriptions Required for Oxygen Equipment? We must have a valid prescription on file for an oxygen concentrator. Accessory items do not require a prescription. What is a Nasal Cannula? A nasal cannula refers to the two soft, rubberized prongs that insert into the nostrils and provide a mix of the surrounding air and oxygen, and is not considered the same thing as the part penetrating the nostrils. The tubing is the ultra-slim plastic tube connecting the oxygen concentrator and the cannula. This is different from a CPAP machine, where it's necessary to create a seal around the nose or mouth with a face mask in order for the device to work. No airtight seal is needed for an oxygen concentrator, which is why both the tubing and the cannula are so lightweight and a lot less bulky than its CPAP cousins. The tubing for a nasal cannula can be purchased in various lengths, allowing for greater flexibility, enabling the wearer to be a good distance away from the machine and still receive the oxygen. Most oxygen concentrators have internal filters which are intended to last the lifetime of the unit without having to be changed or replaced. Some have external filters which would need to be changed if damaged in some way. How Often Should I Replace My Oxygen Cannula? When new to oxygen therapy, you may not realize that your oxygen cannula is detachable from the tubing that delivers oxygen to your nose. The "cannula" is the flexible little piece of plastic that you would insert into your nostrils to help you breathe. Before deciding to change the oxygen cannula, it's important to understand how you use it. If you use your oxygen therapy all the time, it's recommended that you change your cannula monthly. Your tubing should be changed every 2-6 months. Sick? Just get over a cold? It's time to immediately replace your tubing and cannula! Your oxygen tubing and cannula harbor many germs, and if you don't change your equipment, you run the risk of another infection. It's important to wash your cannula weekly. If you notice the plastic beginning to degrade, crack, or fall apart-- it's time to replace your cannula. Keeping on top of your oxygen cannula and replacing it on schedule will keep you healthy and make sure you get the most out of your therapy.